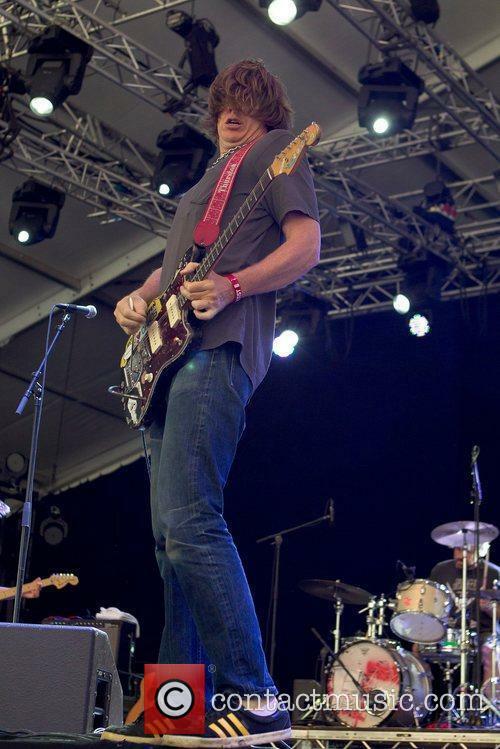 Thurston Moore and We Were Promised Jetpacks among Live At Leeds 2015 line-up. Every year in Leeds, the May Bank Holiday marks the return of a whole bunch of great gigs for the annual Live At Leeds festival. Played by tons of bands at venues all over the city, the festival pulls in a good crowd with its diverse line-up. 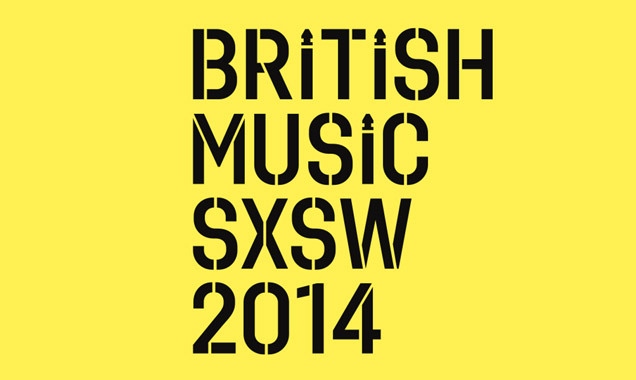 In the past, the festival has hosted loads of great acts including Bombay Bicycle Club, Wild Beasts and James Blake. 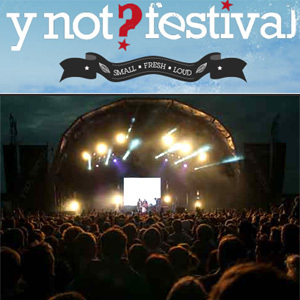 Last year's festival brought in a number of popular acts including Clean Bandit, George Ezra, Kodaline, Little Matador and Pulled Apart By Horses - a line-up which helped win the festival its 'Best Metropolitan Festival' accolade, beating Brighton's popular 'Great Escape' and pop-punk festival 'Slam Dunk' to the top spot. 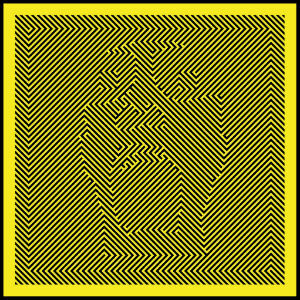 After endless touring, We Were Promised Jetpacks have finally got together, put some tracks down and given the fans what they want; third album 'Unravelling'. It's hard to believe that these guys came onto the radar in 2009 with their truly magnificent album 'These Four Walls', but producing such a debut album does set the standard high. 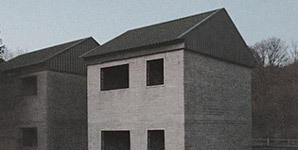 The band have already released two singles from the album; the first being 'Night Terror'. It is a bass-led track and shows that the band are a bit more mature and, in some respects, more focused. Even with Adam Thompson's vocals they seem a bit more channelled and a little less raw, which for me is part of the magic of these guys. The other single is 'I Keep It Composed' which shows a somewhat darker and heavier side to the band and, as far as singles go, although both of these tracks showcases a different side to WWPJ, they aren't the strongest songs on the album. The album kicks off with 'Safety In Numbers', which straight away gives you the sense that these guys still love to blast out their guitars together like a firework display, showing that they are not afraid to have music with gaps of no vocal. 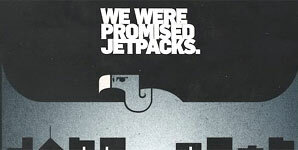 One of the album highlights is 'Peaks and Troughs'; it's what We Were Promised Jetpacks are all about - the unexpected. When you listen to this, you feel like it is going to pitter out into the distance, but far from it and, like its name of sorts, this song is spectacularly up and down. 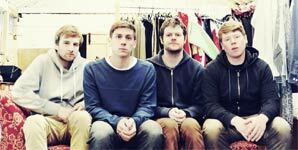 Has it really been nearly two years since We Were Promised Jetpacks played in Nottingham? Blimey, they have been missed! Let's Buy Happiness from the depths of Newcastle acted as the support band for the evening. Now, nine times out of ten, the support acts at these smaller gigs are normally some local band and/or just disappointing. But that night saw one band which was not. Let's Buy Happiness had a great energy surrounding them and were a fantastic introduction to the night. It's been something of a slow-burning process for Edinburgh quartet We Were Promised Jetpacks in piecing together that archetypical "difficult" second album. Having existed as a band for the best part of a decade now, they're still only in the infancy stage as far as releases go, having enjoyed a whirlwind start to life as a signed band three years ago on the back of lead single (and some would say albatross) 'Quiet Little Voices'. Of course, anyone that's seen them live or heard their excellent debut 'These Four Walls' will quickly spring to their defence, casually reminding all and sundry that aforementioned single is merely the tip of a potentially inflammatory iceberg. Review of We Were Promised Jetpacks Live at The Bodega, Nottingham, 9th November 2009 with support from You V Me. 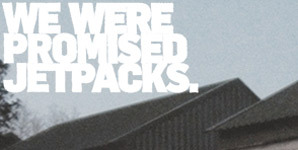 Review of We Were Promised Jetpacks album 'These Four Walls released through Fat Cat Records. 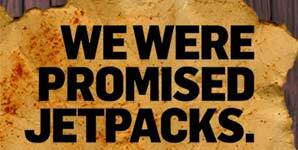 Review of We Were Promised Jetpacks single 'Quiet Little Voices' released through Fat Cat Records.